I see a pattern emerging. I bought this blouse back in January sometime. It was too cold to wear it, but I've been thinking about it ever since. I've also been looking for more like it, and really anything in an off-shoulder style. I plan on wearing it for the rest of the summer. You will probably get sick of it. The other day I was "Facetiming" with my mom and had two bits of news to announce. First, I bought Birkenstocks! Her response was "You bought WHAT?" I'm pretty sure I bemoaned my parents' choice of footwear my entire childhood, so I understand. I did own a pair of the close-toe Birkentstock after high school, but now I've switched over to the classic Arizona style. I wandered into Nordrstom to check out their annual sale and found these amazingly comfortable soft footbed Birks instead! They're a little trickier to style than I expected, but I've been gathering ideas from blogs like The Chic Curve and pins like this one! Even thought I'm still working out what to wear them with, I'm so glad I'll have them for my trip to New York. That's my other bit of news! I can't give many details, but trust me, you'll be hearing about it! This off the shoulder blouse is so pretty! I want one like it! 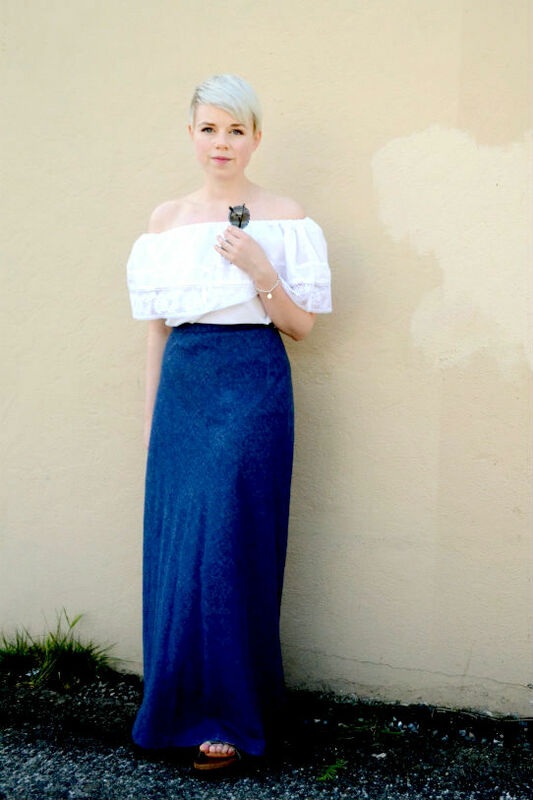 I love the denim skirt paired with it. A trip to New York? This I can't wait to hear about! I hope you're taking this top with you because seriously, it is stunning. I'm going to NY too! Awesome! I love this look and I'm glad you've got Birkenstocks. I hated my hippy parents' footwear and rebelled with pointy, narrow shoes. But then, I caved and got Birkenstocks when I was in college. Then I hated them again and now I want a pair. I'm so fickle! I can't wait to see all the ways you're going to style yours! Your haircut is to die for. I truly love your blog so relax and comfortable. Im back to please leave a comment. When you get tired of that top send it to me. I love tops like that. Stunning, romantic, and poetic! 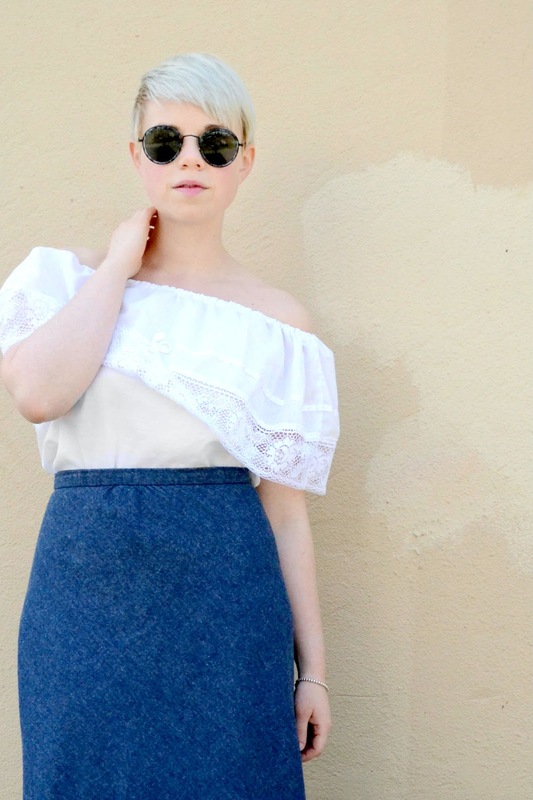 You had me with the off-shoulder top! GORG & chic!